Is your company sending trucks out with full or mostly full loads each day? If not, you may be wasting valuable time and money supplying more trucks than necessary with additional loads to deliver orders on time. So how do you maximise your truck capacity? Omnitracs Roadnet Anywhere Routing could help you solve this problem. It allows you to easily create routes that maximise capacity. The software allows a user to set rules that are unique to your business. These rules can include defining what time you want the route to start, how long the day should be, a maximum number of stops and most importantly in this scenario, you can set a percentage for minimum route capacity. 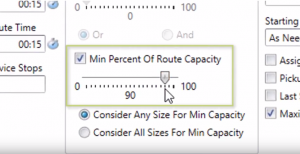 For example, if you set the minimum route capacity to 90 then it must be loaded to 90% for the route to be created. Roadnet Anywhere Routings advanced algorithms build the routes, in this case, ensure your trucks will not leave until loaded to your defined capacity or greater. 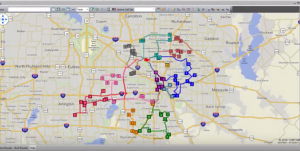 This route capacity setting is only one of many options users have at their disposal to build routes that build efficiency, reduce costs, and improve customer service. Contact Market Motion today to learn more about how Roadnet Anywhere can help with your business.